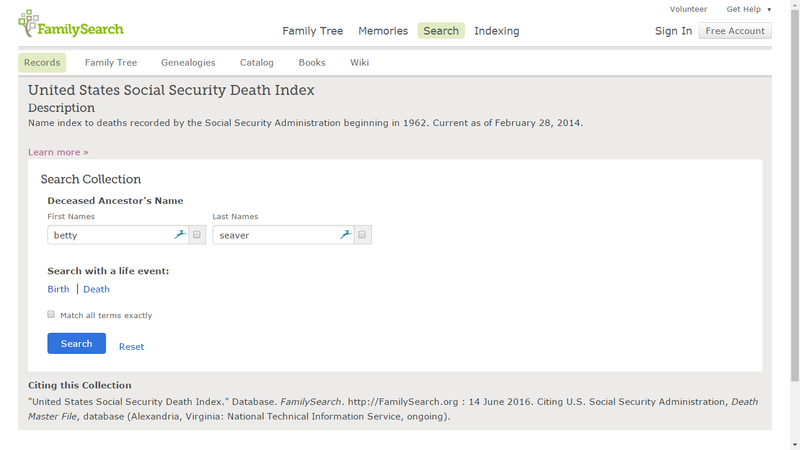 One of my favorite record collections for genealogy and family history is the U.S. Social Security Death Index. 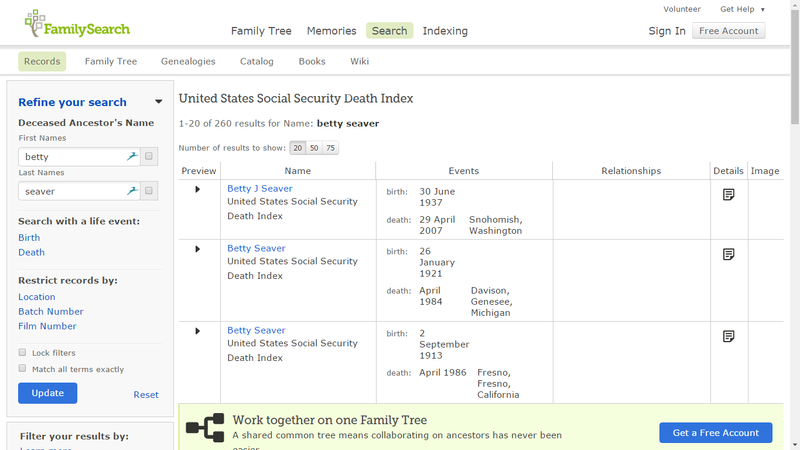 "The "Social Security Death Index" is an online searchable database. 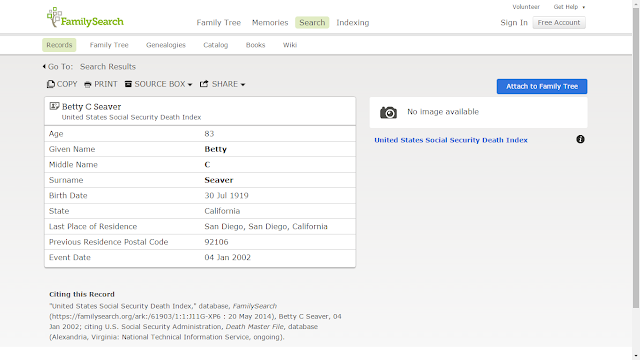 This index is a master index file of deceased individuals whose deaths were reported to the Social Security Administration. It has been kept since 1962, when operations were computerized. The index includes a few deaths from 1937 to 1961, about 50 percent of deceased persons from 1962 to 1971, and about 85 percent of deceased persons from 1972 to 2005. Records for the most recent 3 years are not available. "Married women are usually listed in this index under their married name. Last names longer than 12 letters are shortened to 12 characters. The death place listed is not necessarily the place of death, it is the last place of residence that the Social Security Administration has on file. When two geographical divisions are given they represent County/State as opposed to City/State. For example Jefferson, Texas refers to the county of Jefferson not the City of Jefferson. If a town name of last residence is not listed, it may be found by use of the Zip code. The death date, residence at time of death, Social Security number, and state of issue are usually reliable information since the information comes directly from the Social Security Administration’s master file. However, realize that errors may have occurred when the information was originally entered. Information listed for the name and birth date was provided by an informant and may be inaccurate." On FamilySearch, the record collection is FREE to search at https://familysearch.org/search/collection/1202535?collectionNameFilter=false. As you can see, the FamilySearch record does not include the Social Security number assigned to her by the Social Security Administration for privacy reasons. 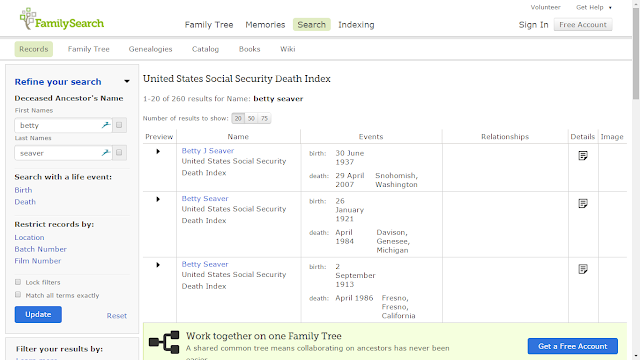 "United States Social Security Death Index," database, FamilySearch (https://familysearch.org/ark:/61903/1:1:J11G-XP6 : 20 May 2014), Betty C Seaver, 04 Jan 2002; citing U.S. Social Security Administration, Death Master File, database (Alexandria, Virginia: National Technical Information Service, ongoing). Why is this one of my favorite record collections? Because the indexed record provides a birth date, a death date (only the month and year before 2000), the last known address, the year and state where the application was submitted. The name is the last one used in the Social Security records. While there is no record image, an image of the Social Security application can be ordered for a fee from the Social Security Administration. Death records for 21st century deaths are hard to find - this collection provides a date which can be used to find a newspaper obituary, a burial record or some other record.